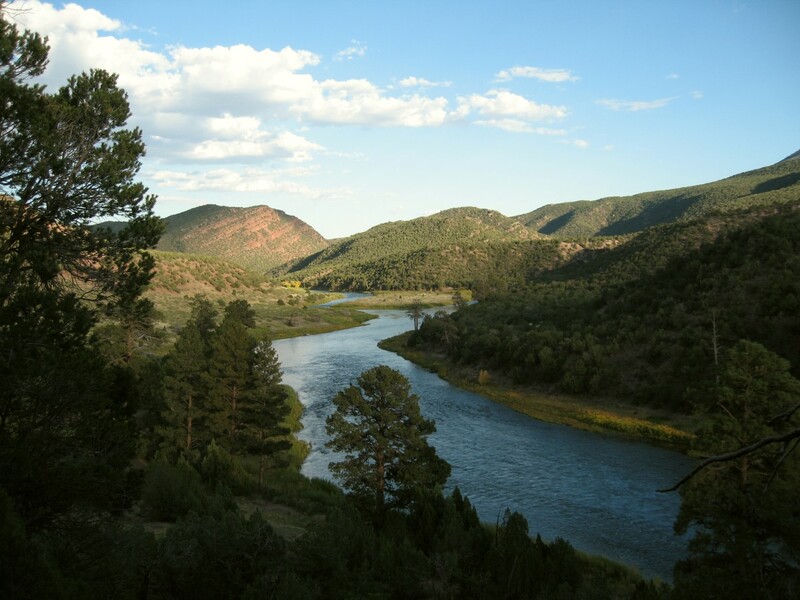 Every fly fisher probably dreams of fishing a true Freestone River where the waters flow unhindered from some distant range of mountains. When casting a dry fly on these sacred waters one can imagine being at the pinnacle of our wonderful sport. The very mention of Freestone is evocative of those wonderful scenes that played out on the silver screen during Hollywood’s rendition of that delightful novella “A River Runs Through It”. The reality of fishing a Freestone River is the fact that one has to choose one’s period on the water almost perfectly to achieve success. If catching fish is how one rates an outing, so many things can affect that success; water temperature, run-off, flow rate, clarity, oxygen level, insect activity etc, etc. On the other hand all one has to worry about when fishing a Tailwater is flow rate; well maybe a couple of other things like water temperature and oxygen content. An established Tailwater will even have insect activity although probably less varied than its Freestone brother. Even water temperature isn’t a major concern because on some Tailwaters the release can be adjusted to provide a reasonably constant temperature throughout the year. 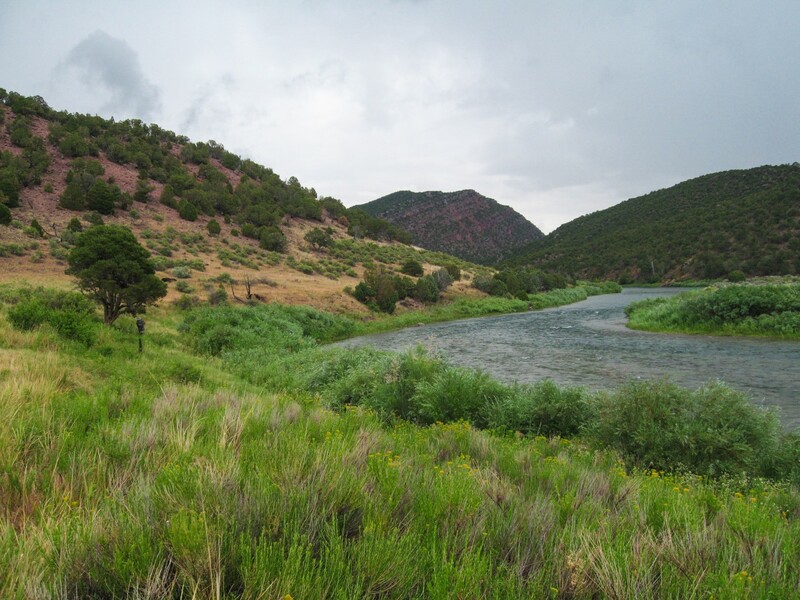 So on one hand we have a river than provides stable fishing conditions through the whole year and another river that requires numerous variables to fall into place for good fishing. Therefore, what makes someone chose a river where they may be unsuccessful as opposed to another where success is almost guaranteed. When put that simply, one might consider it a very easy to give a definitive answer. However, having just returned from a Western fishing trip that included both types of fishery I will endeavor persuade you that the answer isn’t that simple. I am often asked which of the rivers I have fished could be classed as my favorite. My normal response to that question is the upper section of the North Platte River which flows from Colorado into Wyoming. I have even gone so far as imagining that location for an overnight camping and fishing trip with my son and daughter who live back in Jolly Old England. 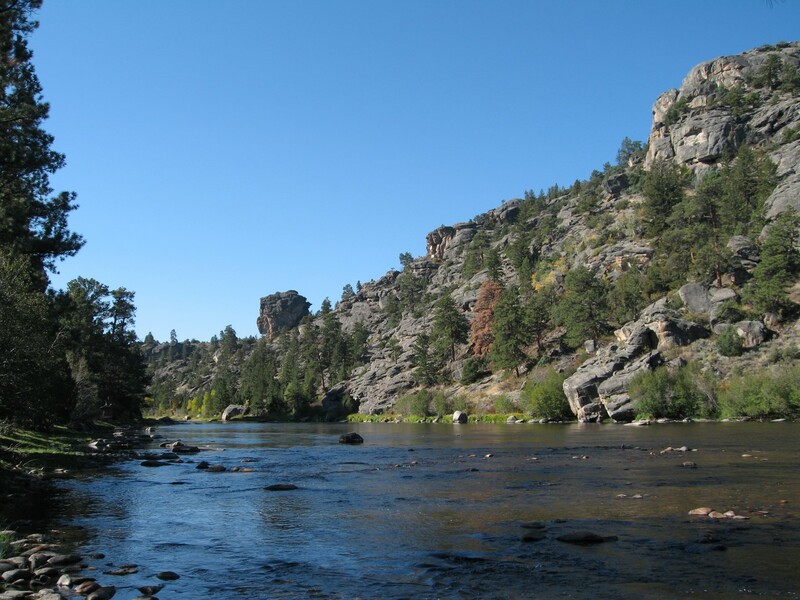 The Upper North Platte checks all the boxes for a Freestone River; its wild, surrounded by delightful scenery, has extensive insect populations and holds some truly memorable fish. Although I haven’t caught my biggest fish there or the largest number in one session, there is something about that river which captivates me. However! For the last four years or so, every attempt to fish the Upper North Platte has been frustrated by adverse conditions; high water temperature, low oxygen, flooding etc. These are typical scenarios that one should expect when planning to fish a Freestone River so one shouldn’t be really surprised. This year was beginning to look far more promising than previous attempts. There had been a pretty good snow pack, cooler daytime air temperatures and local guide service fishing reports were looking positive. This is a direct quote from one of those reports “Sallies, PMD’s, Green Drakes, Caddis, the list goes on and on of bug activity up there right now! The Salmonflies have tapered off but don’t be afraid to still throw the big foam dries if you go”. A dry fly fisher’s dream and obviously we couldn’t go wrong. So 2014 saw the North Platte reappear on our agenda for the annual pilgrimage to the West. I will say that even with these glowing reports we added a Tailwater fallback option; the Green River below Flaming Gorge Dam. On arriving at the North Platte we were still having positive thoughts; the water registered at about 62 degrees, color was good and levels were suitable for safe wading. Wow, things really were looking good. A few warning signs were around for the observant; no insects in the spider webs, no flying insects of any kind and no rising fish. Not to worry, hatches are sporadic on the North Platte and not as predictable as rivers like the Henry’s Fork. The first morning high up at Bennett Peak saw me flay the water with giant stonefly patterns, caddis imitations and sweet little PMD’s. Apart from a couple of excitable young Brown Trout, nobody seemed interested in my offerings. So a change of tactics saw me work long sections of bank with my normally irresistible hopper patterns. I even stalked the back eddies looking for the Trico sippers we so often found there. All to no avail even when clouds came and went with the promise a potential hatch, the surface didn’t reveal a single rising fish. After four hours my enthusiasm was waning and my hands were reaching for my Soft Hackle box. Anybody that has read my Blogs entries will know that dry fly fishing is as far up there as pint of beer (real beer) in an English pub. However when in Rome! So on went the trusty cased Caddis soft hackle and the catching began. Over the next three of four hours my net dipped to receive arriving fish sufficient times to satisfy any fly fisher. The only problem for me was that the darned fly had to be submerged to catch the fish and even though I occasionally switched back to a dry, the fish consistently refused any surface offerings. Our second day on the river was further upstream and offered miles of water. Conversations in the parking lot included talk of BWO’s so once again the vest pockets bulged with dry fly boxes. Arrival at the water revealed that the only creatures populating the air above the river were tiny Diptera. Not to worry, I had my midge box too, so all was well with world. The only problem was that none of the fish seemed to have read the fishing reports and none appeared willing to show a snout above the surface. I covered miles of water and worked every pocket, bank edge, back eddy and run with only one rather unhealthy looking fish showing any interest in a dry fly offering. It didn’t take long for me to recognize that if I wanted to catch a fish then the soft hackle box needed to be easily accessible. These subsurface offerings did the trick and once again my soft hackles earned their keep. So at the end of two full days of fishing the Upper North Platte the score was dry flies 2 and soft hackles 25. A figure that most other fly fishers I spoke to in the parking lot seemed to envy as they shuffled passed despondently. Not a bad couple of days fishing if one counts fish although that lack of dry fly fishing really had me crying in my weak beer. I dare say that if I wasn’t such a dry fly purist and had been prepared to tie on a streamer the “catching” would have improved, although I’m not sure the pleasure rating would match. Anyway onwards and upwards, so off we head for the ever trusty Green River. Over the next four days the fishing was incredible. Almost all fish caught were taken on dry flies and every one of them measured just short of that magic 20 inches. Only a couple of times did the soft hackle box emerge from my pocket and that wasn’t until each and every run had been closely searched with a dry fly. I even found solitude in some of the most beautiful red rock countryside while I caught fish on dry flies. So there we have it; my favorite Freestone River provided a couple of fish taken on a dry fly while our Tailwater choice provided beer swollen tales of trout gulping dry flies. Over that last ten years we have fished the Green River almost every year and had great success. 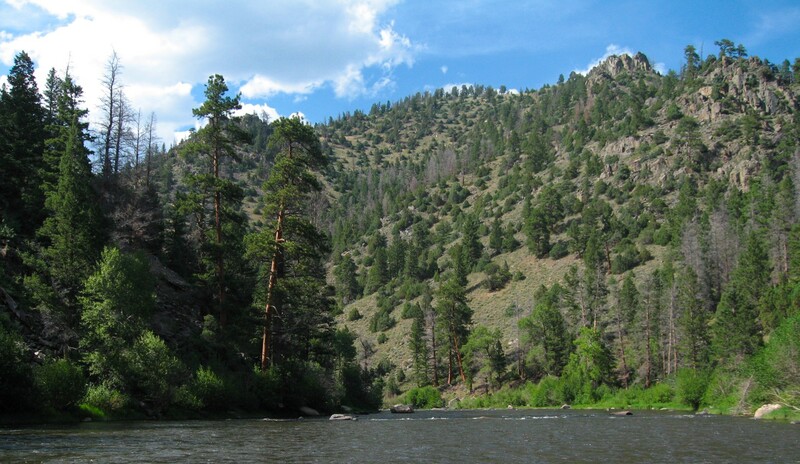 In that same period we have attempted to fish the Upper North Platte and been disappointed on most occasions. On at least one occasion the water conditions made me think the river would never revive. It was somewhat reminiscent of the Big Blackfoot which featured so prominently in Norman Maclean’s beautiful story. 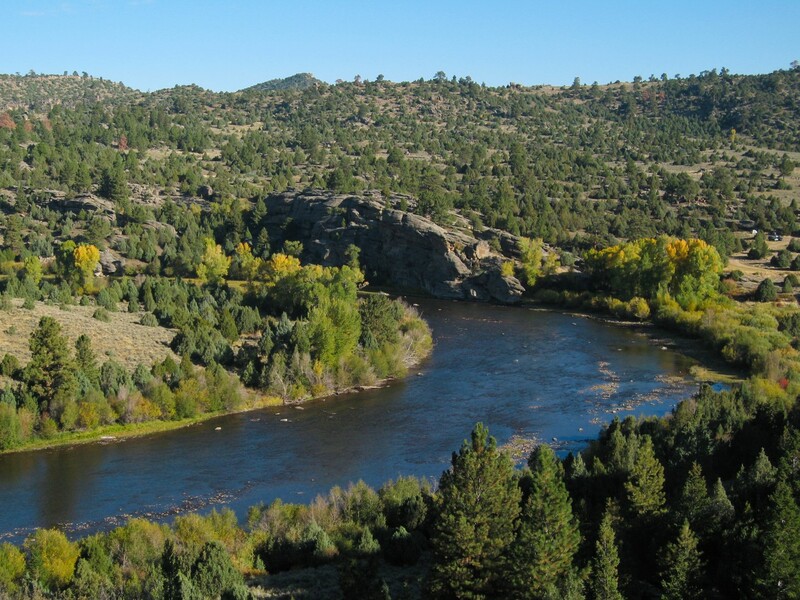 Even Robert Redford had to relocate the filming to the Gallatin because the Blackfoot was in such a sorry state. You may now ask if my love of the Upper North Platte was diminished after so much disappointment; strangely the answer is yes and no. I still love all those aspects of the river that first attracted me although there is only so much scenery I can admire on a fishing trip if I’m not catching fish. So should I give up on it; well I’m certainly tempted because there are other Freestone Rivers I have yet to fish and maybe one will become my next favorite. Why not switch my allegiance to a Tailwater like the Green; again it’s difficult to give a definitive answer because I’m loath to replace a Freestone River with a Tailwater. Exactly what is it that holds us to our believe that Freestones are the rivers of our dreams? So often I hear other fly fishers say, “Oh it’s a great river for Tailwater” or “It’s pretty good if you don’t mind fishing a Tailwater”. Maybe it’s the mystic of a natural Freestone River rather than the manmade dependability of a Tailwater. There is definitely something that stops me throwing in the North Platte towel although I can’t quite put my finger on it. One thing is certain though; if you only have a limited time to fish a distant river then one that provides consistently good fishing conditions should figure high on the list. At the end of my six day trip, the Green has risen up my list while the North Platte had slipped further down the list. I haven’t totally given up on it, although I will have to be convinced that the fishing has returned to the previous quality before I pay for another airline ticket. So did I provide an answer to the question of “Freestone versus Tailwater”? I suppose not, although I hope I have provided the reader with the thinking behind our love of Freestones waters. My next adventure will feature a Freestone River in the Snowdonia National Park in North Wales with native Grayling who absolutely adore dry flies; more about that later. If you want some visual accompaniment to this article then take a look at the short video I compiled of our Freestone and Tailwater adventure. 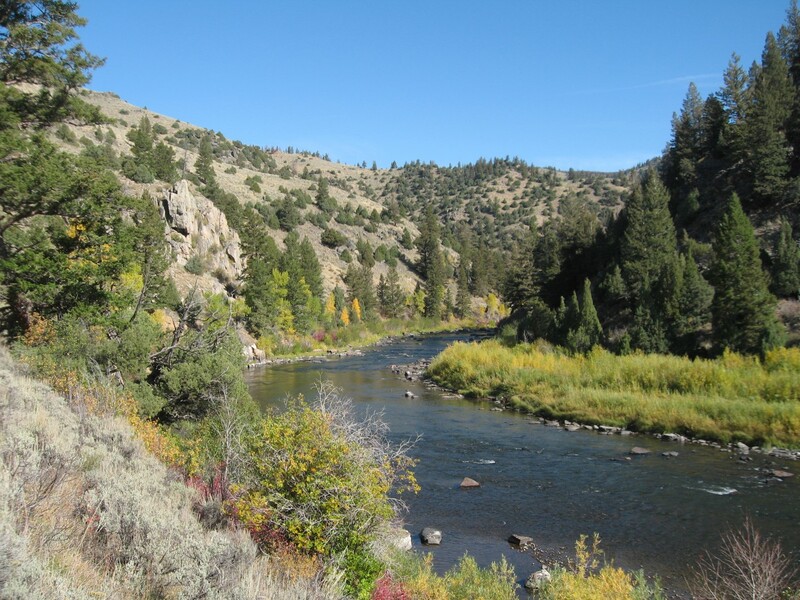 This entry was posted in Fly Fishing and tagged dry fly fishing, freestone, green river, north platte, six mile gap, tailwater, upper north platte, utah, wyoming. Bookmark the permalink. Love it Keith. As for me Iâm a freestone man all the way. That said I still want to fish the White with you. Thanks for your comments Willoughby and maybe a few days on the Green might have you in a dilemma! As for the White, well you will have to wait till I’ve had my injection of England and family. Currently we are working with the City of Electric City WA on developing strategies to improve local resident health and increase tourism through development of sidewalks, along the main street in town. We recently held a series of community workshops in the City of Electric City to develop this project with community input. We are currently putting together posters and a booklet that document the community design process, as well as identify best practices in paths and trails through using examples of projects completed by other communities. We would give copyright indication and credit to you to your specifications. The posters and booklet will be printed in small quantities (posters: 2, booklet up to 5) and be available to community members and others interested as PDFs on our website and through the City of Electric City. There is no profit or fee for the posters and booklets. Please let me know if you require a larger resolution and an email address I can send it to. We appreciate your allowing us to use the image I believe the resolution I found online will work but my email is krisandrah.crall@wsu.edu if you have any other questions or concerns. I would appreciate seeing what you eventually produce. Of course, where would you like me to send you a PDF?